Thursday started with a 7:30 alarm and a 30 minute ride to the Denver Airport. 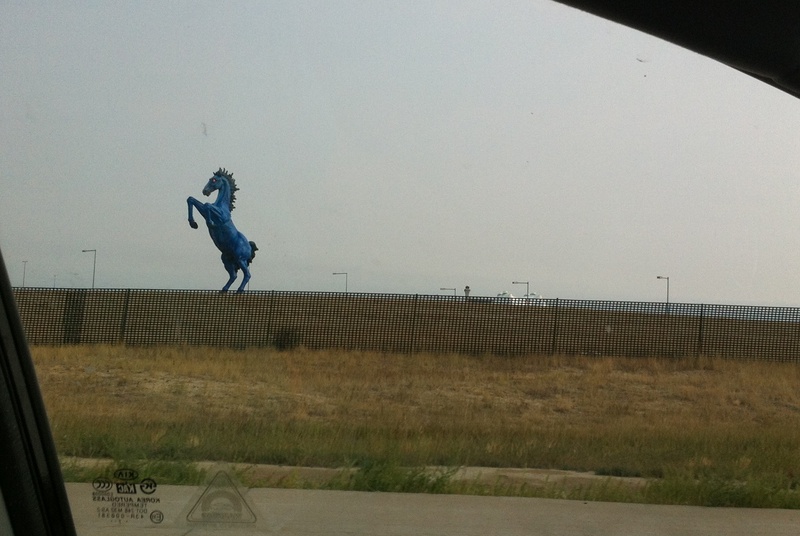 As you enter the Airport’s grounds a blue bronco statue catches your eye. Dustin said that most people don’t like it and think it should be taken down. In an ironic and unfortunate twist, the sculptor who was working on the horse in his studio was killed when a section of the bronco fell and severed an artery in his leg. My flight left a little late but was OK despite the child vomiting in the row behind me. I was able to tune it out and work on my post for Wednesday. We landed in Milwaukee at 1:45 PM and I stayed at the Airport for an hour and a half to finish up the post. I got to my car at 3:45 and was parked in the Brewers 1 lot at 4:15. This is when I really started to feel miserable (sore throat, aches, etc.). I wanted to drive back to Fort and hibernate for a few days. I listened to a few podcasts in my car and decided that I should walk the parking lots and spread the word, despite my exhaustion. I probably talked to about 60-70 people and even though it didn’t cure my likely cold, it made me feel a little better. There are free donor drives (where they take a cheek swab to collect some saliva) coming up in and around Milwaukee. I chose a 100 mile radius so if you click that link you’ll also see a few in Beloit and Rockford. There is one in Racine tomorrow, Saturday the 18th, then two in Milwaukee next weekend. The first is on Friday the 24th and the other on Saturday the 25th. 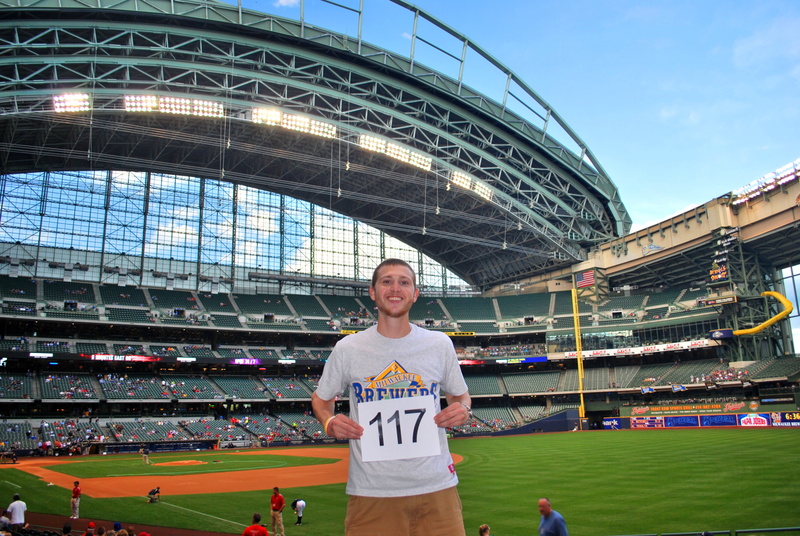 I was inside Miller Park at 6:25 and went to section 108 to get game photo number 117. A gentlemen agreed to take the picture for me but after a few attempts (with coaching after each one) he gave up and said I would need to hire a photographer. I give pretty specific instructions but it’s also not rocket science. Another fan took over and got the job done. After getting the picture I went to the loge level and got a Polish sausage with caramelized onions and a lemonade. That’s the cure-all for colds, isn’t it? 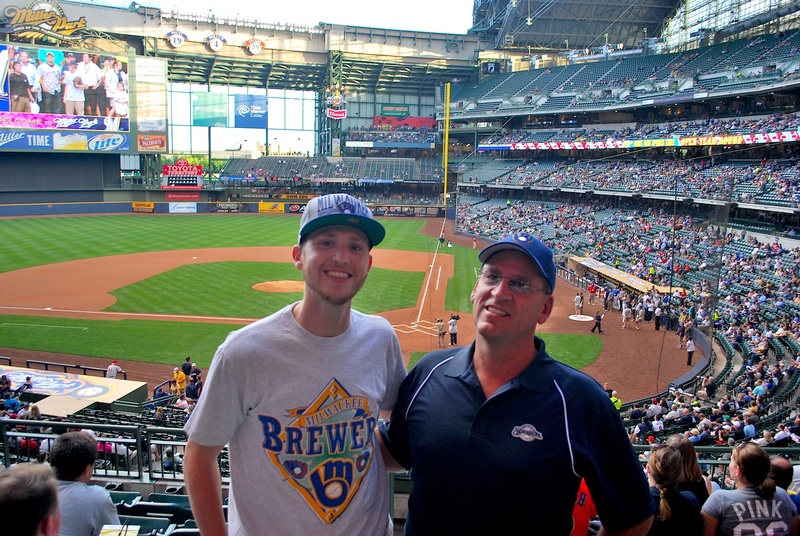 Dustin’s dad, Luke, was joining me at the game and I met him in our seats. I had a fan a few rows back get a picture of the two of us before the game got underway. 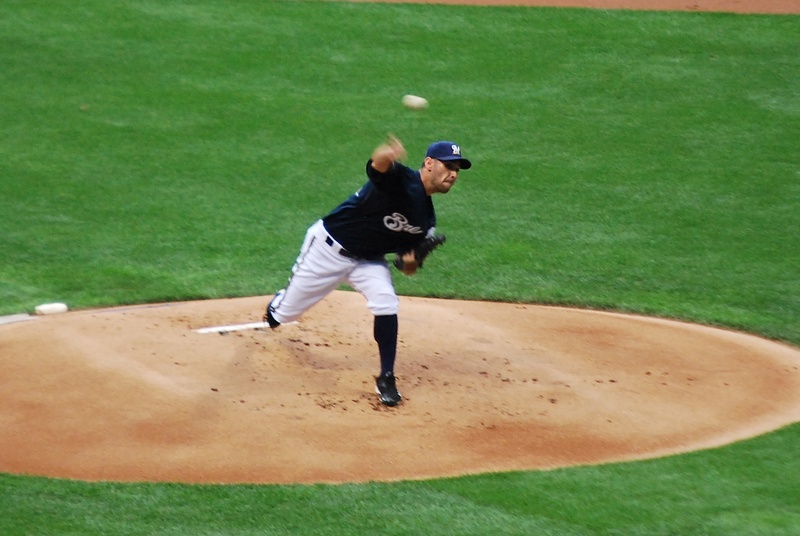 Marco Estrada got the start for the Brewers and I think this is the first pitch of the game. I vaguely remember a cotton candy vendor being in the way for the first pitch so maybe this was the second. When I say the vendor was in the way I mean for a picture, I’m still able to stand up or move side to side as to not miss a pitch. The Brewers wasted no time getting an early lead, as Ryan Braun and Aramis Ramirez went back-to-back in the bottom of the 1st. 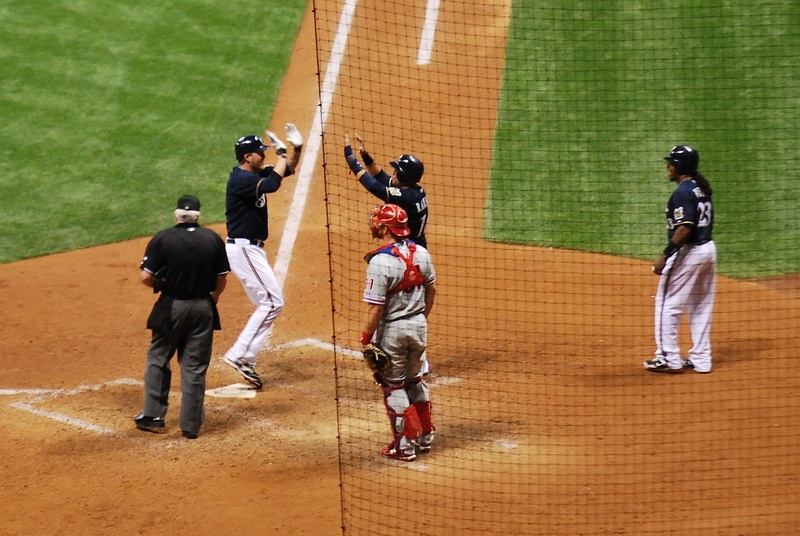 I’ll take credit for Braun’s home run because as Cliff Lee was about to deliver the first pitch of the at bat I was telling Luke that “Braun hasn’t homered since” and then said “TODAY!” as the first pitch neared home plate (it resulted in a called strike). 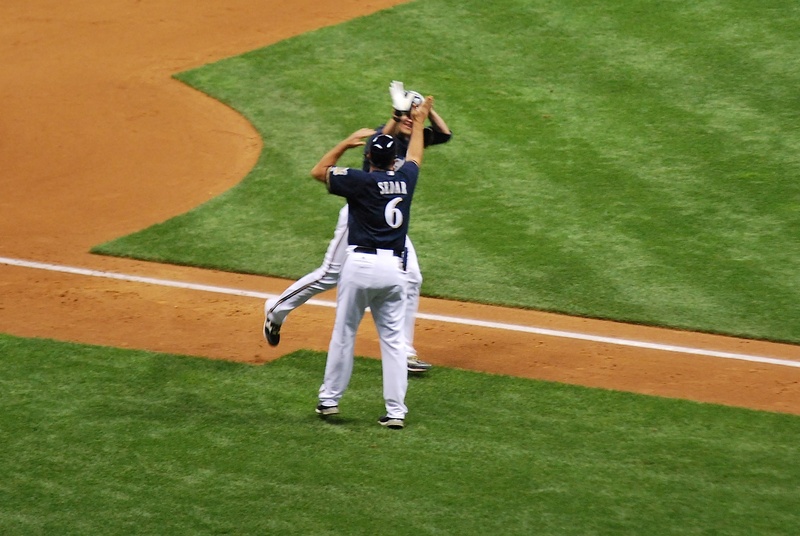 On the 0-2 pitch Braun listened, though, and gave the Brewers a 1-0 lead that would grow to 2-0 five pitches later. 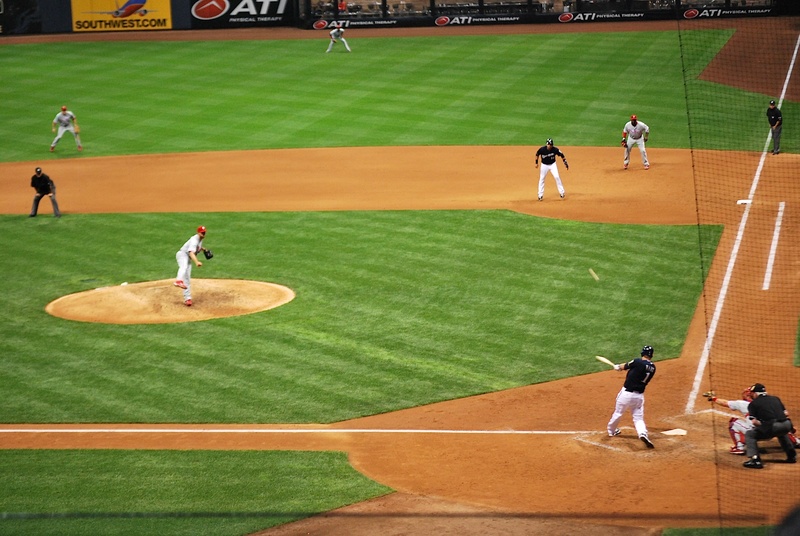 Ryan Howard drove in a run in the top of the 3rd on a ground ball that could’ve ended the inning. 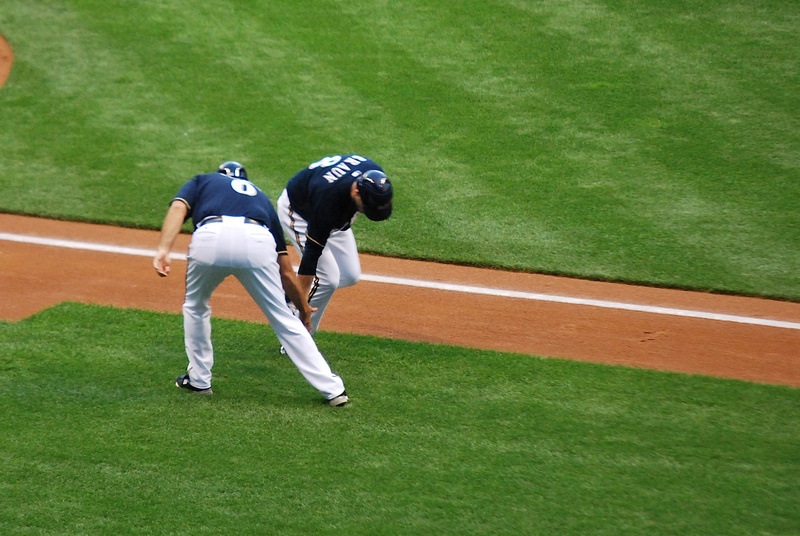 Rickie threw to Segura at second and he tried to turn a quick double play but didn’t catch the ball first. Estrada got out of the inning without allowing another run. 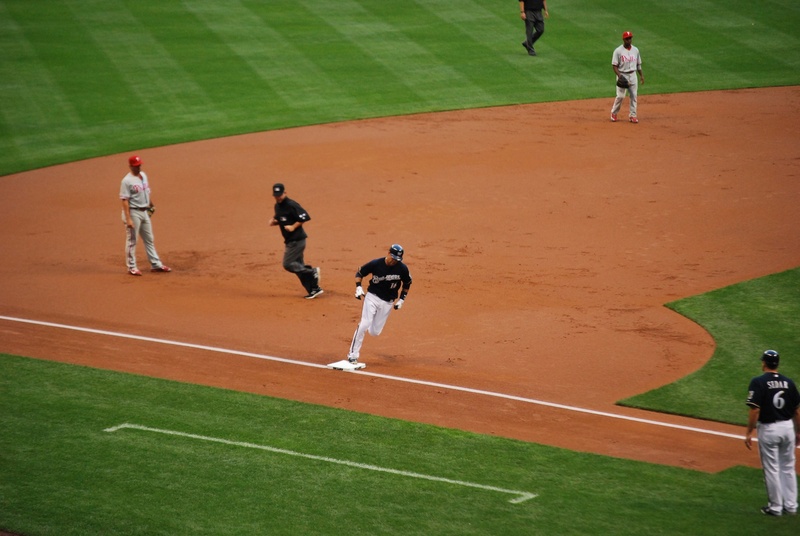 In the bottom of the 4th Braun homered again, giving the Brewers a 3-1 lead. In the top of the 5th Estrada recorded two quick outs but then gave up a single, a walk, and another single. Kevin Frandsen had a good at bat and lined the full count offering to left centerfield, clearing the bases and putting the Phillies in front 4-3. 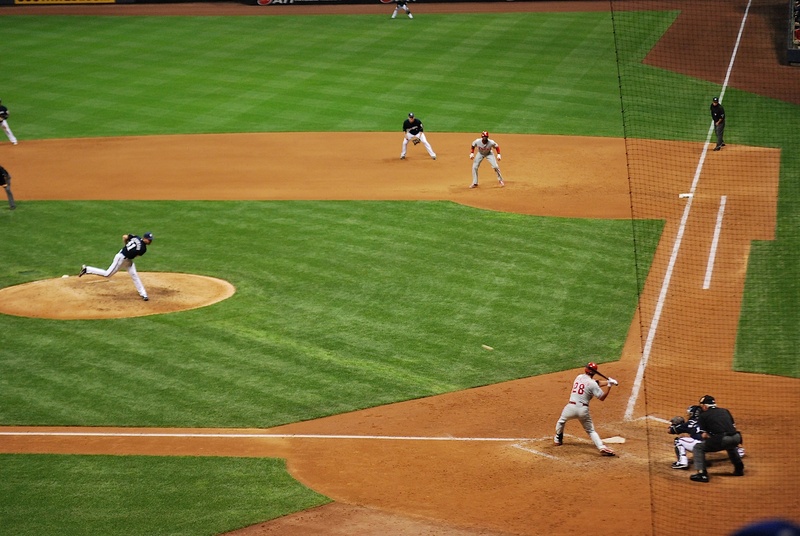 The Phillies maintained that lead going into the bottom of the 8th and it wasn’t looking promising for the Brewers. 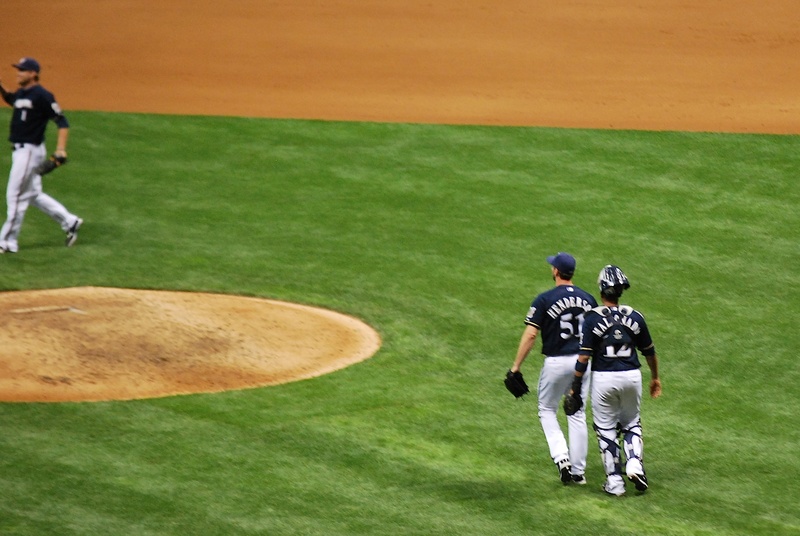 The Crew was down to their final four outs when Rickie Weeks reached on a throwing error by Frandsen. Braun and Ramirez were walked, and the stage was set for Corey Hart, who up to that point had struck out in all three of his plate appearances. Hart lifted it to right and deep and it *barely* cleared the fence in right centerfield. Domonic Brown tried to rob Hart of the salami (grand slam) but he narrowly missed it. 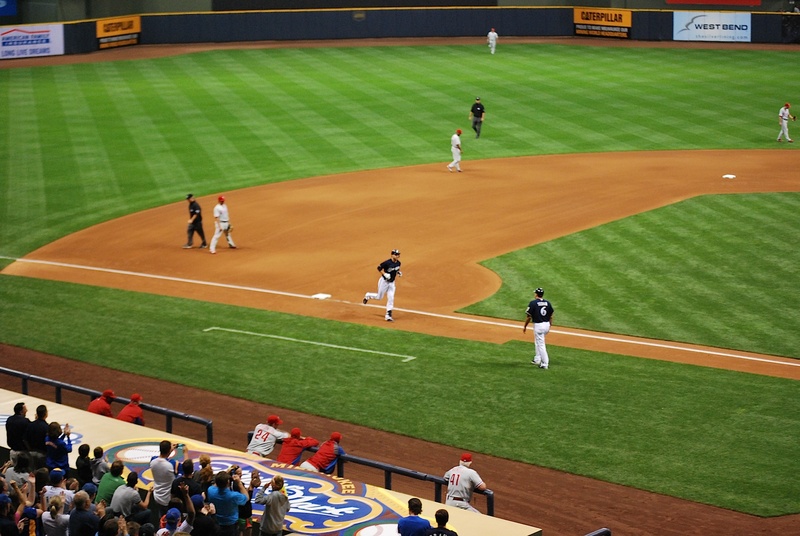 The pitch resulted in a groundout to Aramis Ramirez and the Brewers hung on for the win. Final Score: Brewers 7 – Phillies 4. I had a good time with Luke and I very much appreciate his $40 donation to Be The Match. We’ve now raised over $3,000 for the Be The Match Foundation. It’s 1:40 on Friday afternoon and I feel just as bad as I did yesterday, maybe a little worse. I got 10 hours of sleep last night but that didn’t cure whatever I’ve got. It’s probably just a cold but whenever I get sick I always think the worst case scenario; relapse. A cold can be a sign because a relapse would result in my body not producing enough white blood cells, which fight colds and infections. No one should be worried but it’s what goes through my mind whenever I get sick, so I thought I would share. This is why I’m so adamant about washing my hands and using hand sanitizer. If I don’t get sick I won’t have any reason to suspect something is wrong. I’ll be taking a nap and I’m hoping I feel better before I leave for game number 118. Before I forget; if anyone is interested in going to the game on Tuesday, August 21st, let me know. Front Row Amy gave me her ticket so I’ll be sitting right behind home plate. My two tickets are in 221 so you would not be sitting with me but you and a friend could have a great time in the seats that I call home. A friend had agreed to donate $100 for the tickets, which is face value, but he coaches football and he realized they have a scrimmage on Tuesday. Leave a comment if you’re interested and we’ll work something out. The money goes to the Be The Match and would cover the costs associated with an individual joining the registry.